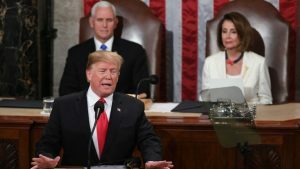 WASHINGTON — Facing a divided Congress for the first time, President Donald Trump warned emboldened Democrats in his State of the Union speech Tuesday that “ridiculous partisan investigations” could derail economic progress. Trump peppered his remarks with calls for bipartisanship, urging Washington to govern “not as two parties, but as one nation.” But his message clashed with the rancorous atmosphere he has helped cultivate in the nation’s capital — as well as the desire of most Democrats to block his path during his next two years in office. The president’s remarks previewed how he planned to defend himself as the new Democratic House majority launches a flurry of investigations into his administration and personal finances. Looking past the funding fight, Trump announced plans to hold a second summit with North Korean leader Kim Jong Un in Vietnam in late February, according to his prepared remarks. The two met last summer in Singapore, though that meeting only led to a vaguely worded commitment by the North to denuclearize. As he stood before lawmakers, the president was surrounded by symbols of his emboldened political opposition. House Speaker Nancy Pelosi, who was praised by Democrats for her hard-line negotiating during the shutdown, sat behind Trump as he spoke. House Democratic women created a sea of white, donning the color favored by early 20th-century suffragettes. And several senators running for president were also in the audience, including Sens. Kamala Harris of California and Cory Booker of New Jersey.